At the New England Aquarium, I spend most of my time working at the intersection of museums and sustainability. About 10 years ago, we realized that the biggest problem facing the oceans was climate change. Yet, almost no one was talking about it in aquariums, zoos or museums. So, with a series of federal grants, we started working on the challenge of how to get more people understanding, talking about, and acting on climate change. About 70% of Americans think climate change is happening now. Yet, 64% of Americans discuss climate change only occasionally or never. If you want to change policy, people need to be talking about the issue to get it on the agenda. So this is a big problem! We realized that museums have a large reach and are highly trusted. About 61% of Americans regularly visit museums and represent a wide swath of society, so if we can reach them, we can have a really big impact. We began to research what effective climate communication looks like, and we began to build a national network of colleagues, using common language to change the public conversation. 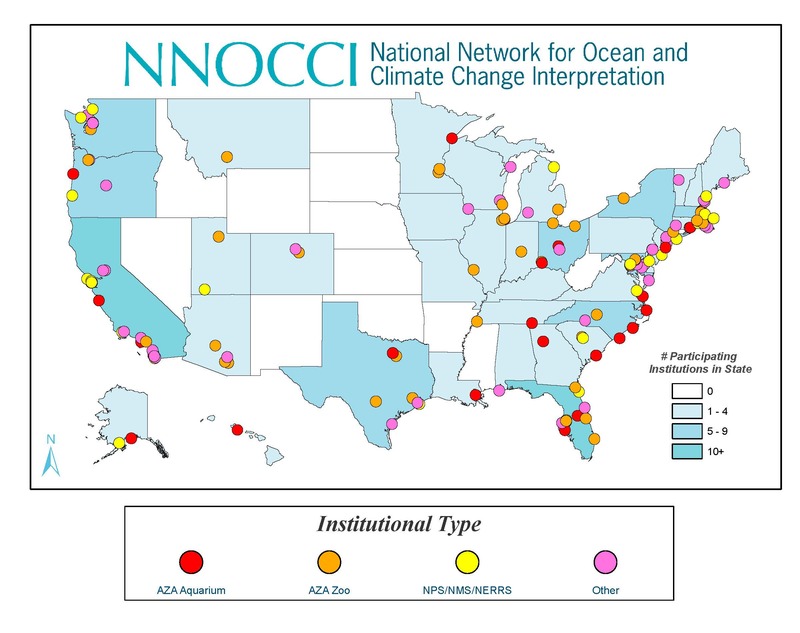 We started bringing together informal educators, along with early career scientists, to learn together in Study Circles through an organization called the National Network for Ocean & Climate Change Interpretation. Across a series of blended in-person workshops, online training, and self-directed practice over 4-6 months, pairs of educators learn the basics of climate science, relevant social science, and practice strategic framing techniques while building a network with their peers. The ripple effects of this work have been surprisingly extensive, with lasting impacts documented on trained informal educators; their colleagues, friends and families; and the millions of visitors they engage with. These impacts include improved understanding of the causes of and challenges created by climate change, greater hope about addressing climate challenges in their communities, and increased motivation to engage in civic climate action. These impacts are long-lasting. In follow-up surveys conducted six months later, visitors report increased confidence in talking about climate change, belief that talking about climate change with friends and family makes a difference, and – perhaps most importantly – participation in civic action to reduce climate change. With 170 aquariums, zoos, and science/nature centers in 38 states now in our network – including states such as Texas, Florida, North Carolina, and Utah – we have begun to build a national movement. We believe that together we can train enough voices in proven communication techniques to shift the national conversation about climate change and engage more people in civic climate action. Museums can serve as conveners and facilitators, bringing together people to discuss important social and environmental issues. And, they can help to build relationships and trust both within and beyond their walls. In an era where partisanship has increased and trust in many institutions has decreased, the general public continues to view museums as trusted and unbiased. By building on careful empirical research to understand what people already value, believe, and understand, we can then design communication strategies that help translate complex science in a way that allows people to examine evidence, make well-informed inferences, and embrace science-based solutions. By using scientifically accurate, tested language, we can make it easier to understand the complexity of earth systems. By connecting to widely held values – such as protection and responsible management – we can help people understand what is at stake and how oceans and climate connect to their daily lives. By helping people understand human impacts, we can help them see how their involvement makes a difference. And, by emphasizing actionable, community-level solutions, we can help to motivate civic climate action.